Written by Isabella Anderson Last time I was in the middle of the jungle at Braulio Carrillo National Park. Sightseeing is great, and if you are in a Costa Rica birding tour, this is a great spot. I watched toucans, quetzals, eagles and a lot of other species. The park is located 20 miles northeast of San José downtown, so it took me a few minutes to get there to continue my Costa Rica adventure travel. 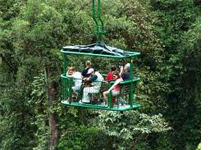 The people at my Costa Rica travel agency kindly included the Braulio Carrillo aerial tram tour in my Costa Rica tour package. As my friends said before, it is impressive, since you can appreciate the beauty of the park from the top of the trees. Access to the park is easy and fast using the road across the park, coming from San José. That road also takes you to Puerto Limón. After hiking on the Capulin trail, I drove to the eastern entrance of the park, 10 miles away. The tour started with a walk thru the park’s trails guided by an experienced guide. From here you will a lot of vegetation, trees, birds and some of the less shy animals, like frogs and ants and some small mammals. As I walked, I was thinking, wow, those three tops are the ones that I will be over in the next minutes! That definitely makes for the excitement of this Costa Rica eco tours. After the hike, we boarded the tram, and halfway to the top the view of the park totally changed. We were impressed! By the time you get to the top, you barely see the ground, and all you see is a dense green everywhere, with mountains and volcanoes far away. The guide will lead you to watch interest things over the course of the tram, and the travel takes a little over an hour. After the great experience, we had a delicious lunch and later we were ready to go back to our hotel in San José. I definitely recommend you this experience in Braulio Carrillo National Park. Add it to you Costa Rica vacation package.